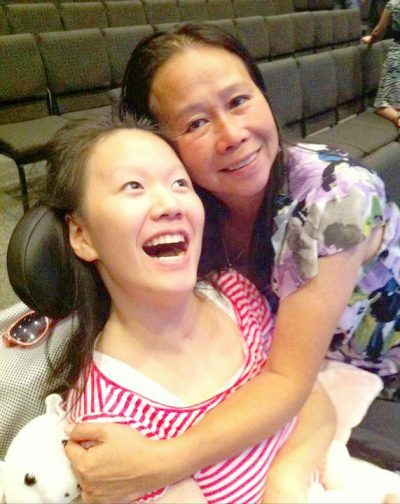 Vanna Nguyen has fully devoted her life to her daughter Queena, after the then 18-year-old was brutally attacked at the Bloomingdale Regional Library and left for dead. She spoke recently about her book, Hope- An Anchor For My Soul. Vanna Nguyen could never have imagined the tragedy that would befall one of her daughters in 2008 and how it would change her life entirely. Having a miracle of her own, though, when she was just 18 years old and escaping communism in Vietnam, helped prepare her, she says. Nguyen, of Riverview, has documented her journey in a new book she is working to get published entitled Hope – An Anchor for My Soul. The book describes her own journey and that of her daughter, Queena, who was brutally attacked at the Bloomingdale Regional Library and left for dead. To this day, Queena is unable to walk, talk, see or eat on her own and is totally dependent on her mom and sister Anna, for her care. In explaining how she has managed to cope after Queena’s attack, Nguyen goes back to her own story, a dark time in her life when her father was imprisoned after the fall of South Vietnam to the communists and how he later worked to get her out of the country and to freedom. Her family had gone from one of affluence to one with no money to even buy food. “We sold everything in the house to survive,” Nguyen recalled. “One day we sold the sink, the TV, the bed, until we had nothing to buy food. In a recent interview, Nguyen described how she and her father, on two separate boats, got separated during the early part of that journey, then were dogged by the communist military who peppered her boat with bullets. Once the boat reached international waters and a storm kicked up, the military boat backed off, but it was not looking good. The escape boat on which Nguyen was a passenger, was in bad shape. It was riddled with bullet holes and the engine died. Sleeping in the boat’s hold, she recalls waking in the middle of the night to an odd sound — whales on either side of the boat, swimming alongside the listing vessel as if to usher it to safety in Malaysia. “It was like they were urging us to go on,” she recalled. That moment, she said, is when she truly found God and hope. She eventually made it to the U.S., and her aunt, who had two daughters and a business, sponsored her. After Nguyen made the decision to let Queena’s identity be public following the attack, she realized, she said, that her story could provide hope for others. To learn more about Queena’s story or to donate to her care, visit www.joinqueena.com.